In January 2011, aboard a scientific drilling ship in the Pacific Ocean, I witnessed an enigmatic green flash before sunrise. This optical phenomenon has been recorded to occur if the conditions are just right – clean, stable air that causes as little scattering of sunlight as possible. Being awake for sunrise and examining volcanic rocks from the sea bed till late in the night was all in a day's work on the Joides Resolution. As a volcanologist, I had never have expected to find myself aboard a drill ship. I normally study deposits left behind by volcanic flows such as lahars and pyroclastic density currents. Lahars are flows of water and volcanic material that has the consistency of concrete but can flow down valleys at speeds up to 100kmph. In Ecuador, I investigated the effect they would have on locals there by surveying the drainage channels down which these mudflows would travel. The data collected was used to produce a model of the drainage, mapping and logging the deposits of previous lahars in relation to important infrastructure that might be affected by a lahar such as bridges and hospitals. 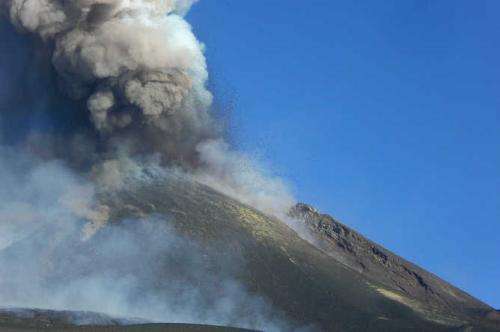 Pyroclastic density currents are flows of hot gas, ash and rocks that are blown out of a volcano and can travel at speeds up to 700kmph and can be as hot as 1000°C. Flows vary considerably in size and speed, but even relatively small ones have the power to destroy everything in their path. It was such a flow that devastated Pompeii in AD 79 during the eruption of Mount Vesuvius. They are one of the most hazardous volcanic phenomena and have accounted for more than 90,000 human deaths since 1600 AD. To learn more about these volcanic phenomena, my research has taken me to Tenerife and the volcanic island of Pantelleria near Sicily. There I studied the deposits left by these flows, hoping to understand how the most recent such deposit, known as the Green Tuff Ignimbrite, was formed around 45,000 years ago. How did the current that produced it behave? Where did it flow, and when during the eruption? Was it able to scale even the largest of obstacles? To answer my questions I would hike out over the rugged volcanic terrain, carefully mapping out the deposits. Through examining them it is possible to deduce the direction that the current was flowing and learn more about the nature of the current and how it changed with time. I also gathered samples through each section I visited so that they could be analysed later in the lab. 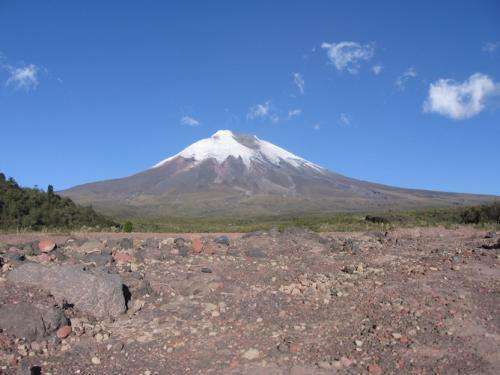 By closely examining the changing chemical composition of the deposits, it was possible to map out when and where the current flowed at different points through the eruption. This gives a much better understanding of how pyroclastic density currents behave so it will be a huge help with mapping future hazards. Studying these kind of volcanic deposits is often done alone. Mostly you are out in remote parts of the island with beautiful vistas for company, armed with just a packed lunch, and your standard geology kit of notebook, hand lens, compass-clinometer, hammer, GPS and ruler. This is in stark contrast to working on the Joides Resolution, the drill ship run by the International Ocean Discovery Programme. On Expedition 330 I was with another 29 scientists. We were all trying to better understand the Louisville Seamount Trail, an underwater chain of extinct volcanoes. Seamount trails like this are excellent recorders of the Earth's deep processes and allow us to untangle the planet's ancient motions. Life on an ocean expedition was very different to the field work I was used to. Long days in the sunshine were replaced by midnight-midday shifts within cramped science labs, full of specialist equipment, with half the science party (the other half worked midday to midnight). 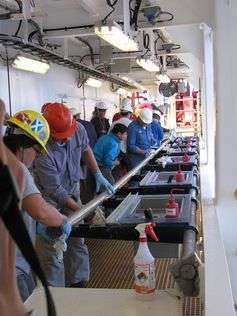 Instead of hiking to samples, they were gathered by a drill rig on the ship and we would wait until rocks were drawn up from depths of 500m under the seafloor. Then each of the groups of scientists would study the rocks in turn; some would run it through machines to understand its physical properties, while others would describe and measure its properties just as you would in the field. By the end of the two-month expedition, we had described and interpreted almost 1km of rock core. Science on an expedition like this moves very quickly. Samples were collected everyday from the core for analysis and the results were back within a few days. Our initial findings told us about the age of the volcanoes, the types of eruptions they had and about the source of the magma that formed them. It also told us that the mantle plume that created them had stayed in the same position for around 20 million years. At the same time in geological history, the mantle plume that created the Hawaii-Emporer Seamount Trail moved 15 degrees southwards. The forces that moved that mantle plume didn't affect Louisville, meaning that we can use the Louisville Seamount Trail to help us reconstruct the motions of the Pacific Plate – essential for understanding ancient plate tectonics. We continue to examine the data collected, looking at various properties of the rocks to work out the source and nature of the magma that formed these volcanoes. This will gives us further insight into the Earth's mantle, a place that we have not yet been able to explore directly, even though it makes up two-thirds of the mass of the Earth. With this in mind, my experience studying volcanoes at sea was one of the most exciting scientific experiences I have had till now, perhaps apart from standing next to, and walking over, actively flowing lava on Hawaii.